Small food is for the commitment phobic. Or maybe just for those of us that want to experience everything. I don’t want to have to decide between a pull pork sandwich, bree grilled cheese and a burger. I want them all. Which is why I will always owe a debt of gratitude to Spain and the brilliance of Tapas. Some people want to hunker down with a bowl of their favorite food and call it a day. I fancy myself more of a food gypsy. I want a bite of everything. I’m the girl at the Thanksgiving dessert table that takes a sliver of each piece of pie, brownie, and cake onto one plate because the idea of not knowing what each type of pie, plus the cherry brownie, plum tart and the pumpkin turtle cheesecake all taste like is unthinkable. While other people can just take a slice of apple pie and watch the game. Lucky bastards. On a lightly floured surface, roll out one sheet of puff pastry to approximately 14.5 inches by 16.5 inches. Using a 3 inch biscuit cutter, cut out 20 circles. Repeat for the second puff pastry sheet. Brush each puff pastry round with melted butter and sprinkle lightly with salt. Line a baking sheet with parchment paper and transfer the circles to the baking sheet(s), butter side up. Bake for 16-19 minutes or until golden brown. Remove from oven and allow to cool. While those are baking, prepare your ingredients. Cut each Mozzarella ball into 5 slices, set side. Cut the off the stem end of the tomato, as well as the opposite, pointed end of the tomato. Cut the remaining tomato into ¼ inch slices. You will need 20 slices. Take one puff pastry round, spread with about ¼ tsp of pesto sauce. Top with a tomato slice, then a spinach leave, then mozzarella slice, then slice of bacon and top the entire thing with another puff pastry round. Secure with a 3.5 inch skewer, if desired. Puff pastry bun…powerful move! I like small bites too. I’m definitely in the food gypsy camp. Looks delicious…. love the puff pastry bun! These are just so cute!! I love little bites like this! You come up with some of the most creative appetizers and this one is no different. 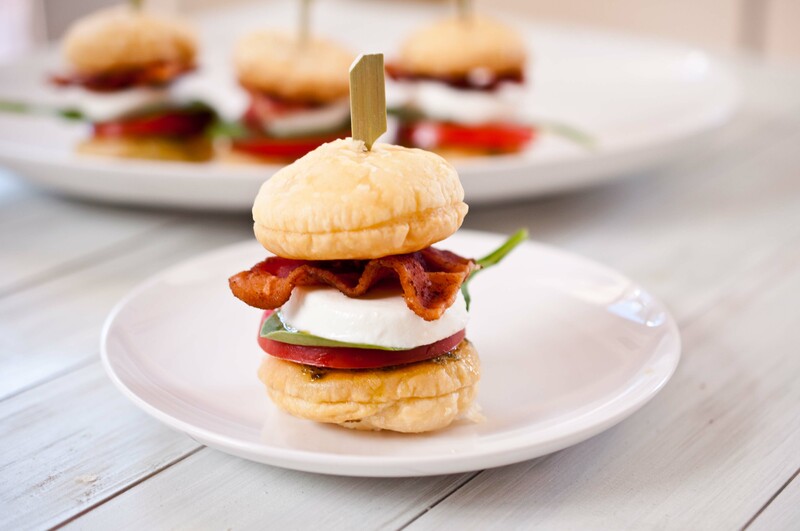 While caprese is a favorite with many, your extra touch with the puff pastry buns really makes it so much better! Tasty creation here. Have a great weekend! I love miniature food for all the reasons you listed. In the last month I’ve made mini quiche and mini Croque Monsierus. The puff pastry bun is a stroke of brilliance. 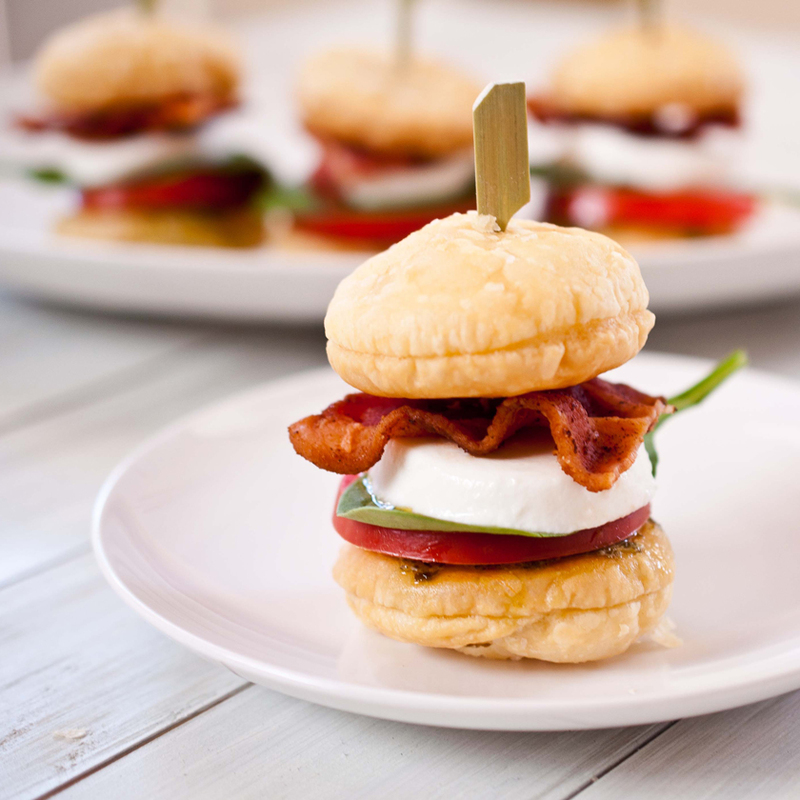 I love caprese anything…and these little sandwiches with bacon are no exception! SO yummy!!! This is so brilliant Jackie! I love the combination, and the puff pastry. So awesome! I am totally the same. Please don’t ever take me to a buffet, it’s just too much. Or Dim Sum! Just roll me outta there. i have to have a little of everything and the more of “everything” well, the more I must eat! One needs to try every taste right? This is my philosophy exactly! Everything, in moderation. You don’t have to feel as guilty if it’s tiny 🙂 Great idea to use the puff pastry! I am exactly like you! I want to taste it all! And that is exactly why I also love tapas! And I love these little caprese bites!! oh my goodness, these look absolutely amazing! i’ve never tried making puff pastry buns but they look wonderful. what a smart idea! I’ve been flirting with adding bacon to caprese – you’ve given me some courage! Thanks!